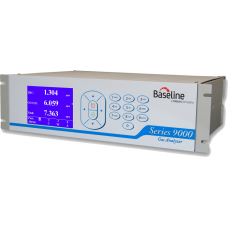 The Baseline® Series 9000TCA is a specialized member of the extraordinary Series 9000 family of gas analyzers. The Series 9000 is the candidate of choice whenever accurate, reliable total hydrocarbon and total carbon analysis is required. The Series 9000 analyzer provides unparalleled flexibility and offers continuous, fully automated gas analysis over a broad range of concentrations. 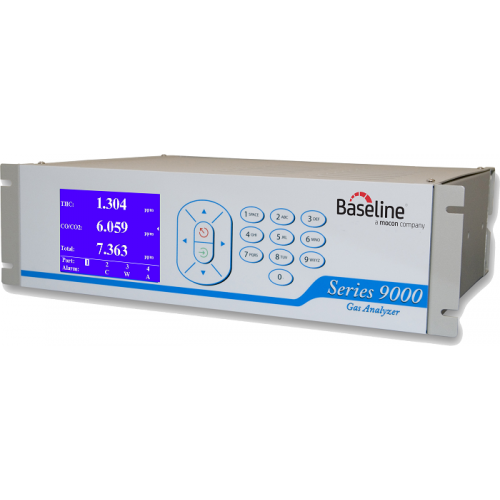 The Series 9000 TCA has a dynamic range from less than 0.1 ppm to 100 ppm, it's designed to measure total hydrocarbon content and provide a combined carbon monoxide (CO) and carbon dioxide (CO2) reading. The analyzer has a generous complement of analog, digital and logic output capabilities. The Series 9000 TCA can be configured with internal components for single or multipoint analysis of non-condensing gas samples. The automatic calibration feature enhances the long-term analytical stability of the instrument. These features place the instrument well ahead of the competition in performance, automation, and configurability. The Series 9000 TCA is designed to continuously monitor total hydrocarbons and trace levels of CO/CO2 in order to provide a total carbon reading. This specialized analyzer is configured for the detection of hydrocarbon and CO/CO2 impurities in pure and ultrapure inert gases such as argon, helium, hydrogen, and nitrogen. Samples must be free of oxygen. Hydrocarbon detection from sub-ppm to 100 ppm levels. Analog output ranges programmable from 1 ppm -100% full scale.